Judging by these pictures, Dylan is not a very good teacher or I am not a very good learner. We can pretend that it's the former. This is microwavable Pakistani food. Mommy's Readymeals. The chicken was gross and the rice was good, but really spicy. The fire department almost had to come over (my god, I am hilarious). 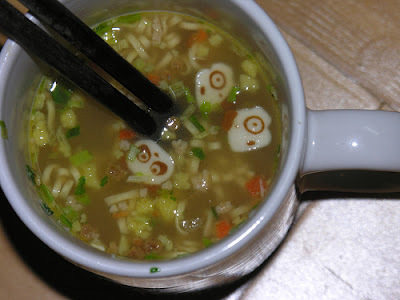 Ramen noodles with really great animal faces. It's like a zoo in a bowl. They were eaten by Vivian and not me. Also, please take note of my new banner made by Alex. Pancakes and syrup. POURING ACTION INCLUDED. I hope whoever this picture belongs to doesn't get mad at me. "it's not like the only people that read my blog don't already know that you made it..."